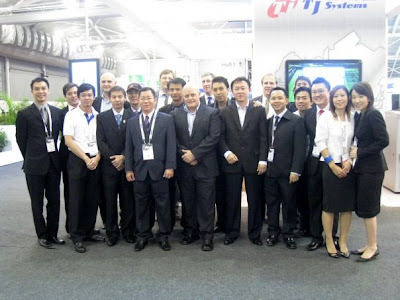 The 3-day Global Security Event finally ended on Thursday. Before I left the hall, I turned back and stole a glance at the setting. Some weird feelings choked up and my heart tightened. I am sure I am going to miss my pretty models and the fun-loving staffs. 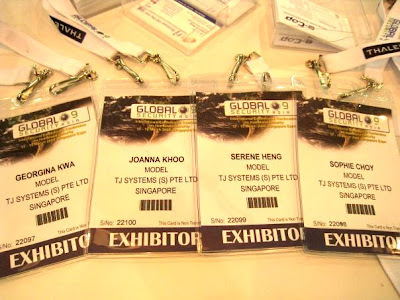 TJ Systems staffs treated us like gems. They took care of us like damsels, chatted casually and laughed light-heartily like we were close friends, prompt us to rest whenever our high-heel killer boots hurt our feet. No employer-employer relations at all. I am so going to miss them all. 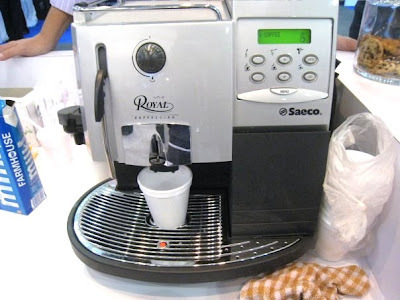 The highly reputable coffee machine that turned us all into kopi soh over night. Other male staffs! I was eating apple when the impromptu picture taking session started. Muahaha. Bmaking coffee and playing wii, our job is to take pictures and rest! Muahaha. Steve, who drove me to expo hall 2 every morning for 3 days! thank u very much! Speaking of Wii, I am a great Wii Tennis player now, second to Georgy though. SHE IS GOOD. haha! The boss of TJ systems, entrepreneur of the year. sophie's leopard jacket is love! Top left: me, top right: georgie, bottom: sharon.